IncludeMaker does not have a direct download source, but one wouldn’t expect this application to have a homepage because it is an adware helper. It means that IncludeMaker functions as a complimentary part of some adware program. Adware helpers might be programmed to do various things, but the point is that you need to remove IncludeMaker and all the adware applications associated with it if you want to avoid serious computer security issues. You would also do yourself a favor if you invested in a licensed antispyware tool that would safeguard your system from similar intruders. Almost anyone can install IncludeMaker on his or her computer accidentally. This happens because adware applications this adware helper is associated with get distributed bundled in software packages. These software packages are available for download on file sharing and torrent websites. Sometimes the installer file hides behind a fake download button, so you might install IncludeMaker and other unwanted programs on your PC without even realizing it. It means that you have to run regular system scans with a reliable antispyware tool and delete any detect threats. According to our security research, IncludeMaker might be used by adware programs that are distributed via the InstallRex installers. For example, if any of the programs from the family gets uninstalled from your computer, but you leave IncludeMaker be, the adware helper might connect to the Internet behind your back and reinstall the unwanted application. And that is just one of the things this adware helper can do. It might also download updates for the associated adware programs or upload collected data. IncludeMaker is designed for the Multiplug type of adware infections that include quite a lot of notorious applications, for example, YoutubeAdBlocker, UniSales, Unideals, and many more. The common thing that unites all the adware programs in this group is that they are supposedly created to perform some useful function, but they certainly do not live up to their promises. Consequently, users have nothing else left to do but remove the program in question from his computer. Needless to say, while you are at it, you need to delete IncludeMaker as well because if this adware helper remains on your system, the unwanted adware application might come back any time. Luckily, it is not complicated to terminate IncludeMaker manually. You can uninstall the application via Control Panel because it has an entry on the list of installed programs. However, to be absolutely sure that your computer doesn’t house any more unwanted programs, scan the system with the SpyHunter free scanner. Should any potential threats be found, remove them at once. Open Uninstall a program and remove IncludeMaker. Select Uninstall a program and remove IncludeMaker. 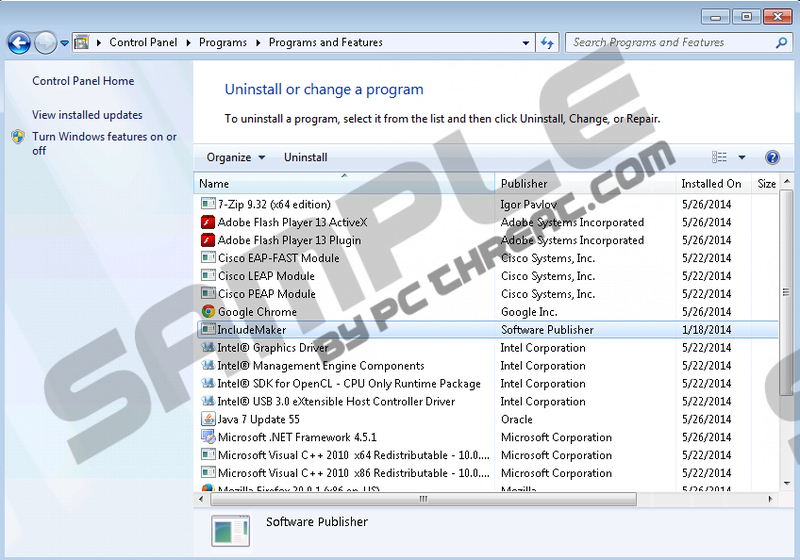 Double-click Add or remove programs and uninstall IncludeMaker. Quick & tested solution for IncludeMaker removal.